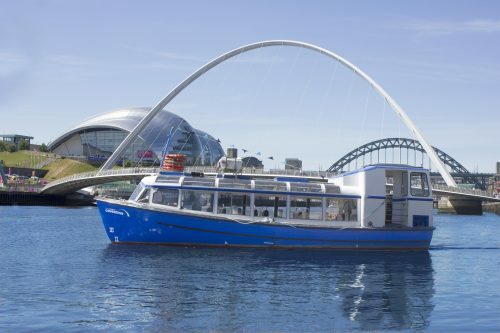 A one hour Quay to City cruise from the Newcastle City Marina (5 mins walk from our pontoon) offers a snapshot of both our 2 and 3 hour cruises. This cruise offers you a fantastic opportunity to view the landmarks of our famous city from the river and to enjoy the spectacular panorama of the Tyne Gorge including all seven bridges. This cruise is aboard our smaller vessel the Coventina, with a capacity of 43. The Quay to City cruise is complimented by a recorded commentary from one of our most experienced commentators. Refreshments – Tea, coffee, bottled drinks, crisps and chocolate bars are available to purchase onboard this cruise. Newcastle City Marina near the Tyne Bridge, still on the Newcastle side of the River, a 5 minute walk from our pontoon.